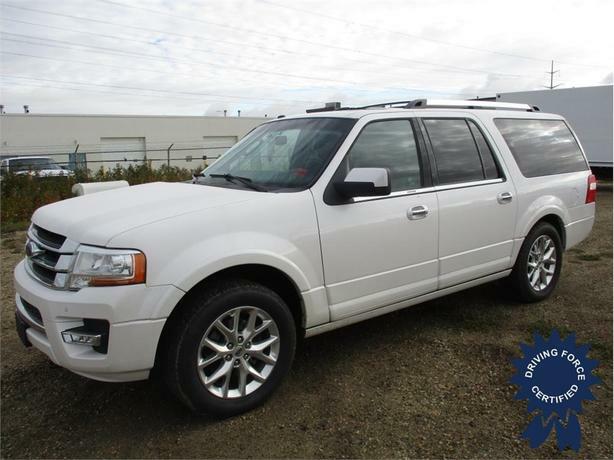 This 2016 Ford Expedition Max Limited Luxury 8 Passenger 4X4 SUV has a 6-speed automatic transmission with SelectShift, transmission with driver selectable mode, electronic transfer case, part and full-time four-wheel drive, limited slip 3.73 rear axle ratio, block heater, 250-amp alternator, Class IV HD towing with harness, hitch and trailer sway control, front and rear anti-roll bars, electric power-assist speed-sensing steering, auto locking hubs, 20-inch wheels, full-size spare tire stored underbody with crankdown, heated/cooled front leather bucket seats, rear load-levelling mechanical system, all-weather floor mats, BLIS (Blind Spot Information System), dual-headrest DVD by Invision, front fog lamps, perimeter/approach lights, 1,600 lbs Maximum Payload, and GVWR rating of 7,760 lbs (3,520 kgs). The 3.5-litre Ecoboost V6 gas engine provides 365 horsepower at 5,000 RPM and 420 lb-ft of torque at 2,250 RPM. Touch base with us to discuss purchasing or financing options that are right for you and experience the difference you will only find at DRIVING FORCE Vehicle Rentals, Sales and Leasing.